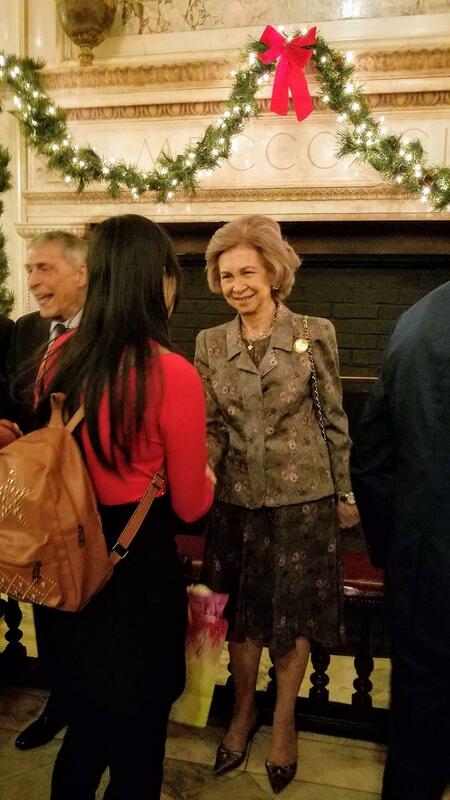 Yesterday the Queen Emérita, Sofía of Spain hosted an event at the Metropolitan Club in NYC. 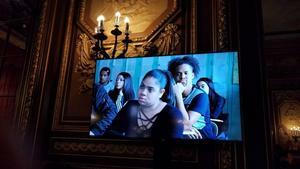 The Queen Emérita was present to celebrate the 65th Anniversary of the Queen Sofía Spanish Institute in NYC. Dr. Mildred Van Zwaren and three of her students: Muntafa Rahman, Zaira Hidalgo, and Kaila Kelsey were invited as guests of Her Majesty to represent A. Philip Randolph Campus High School and the Queen Sofía Spanish Institute at this event. One of the missions of the Queen Sofía Spanish Institute is to sponsor educational programs about Spanish history and culture in NYC. Mrs. Patrice Degnan, from the Queen Sofía Spanish Institute has been very generous with our Advanced Placement and Heritage Spanish students over the last few years. Dr. Cristina Domenech, the Coordinator of Education and Public Programs for the Hispanic Society, and her team have come to APRCHS on several occasions to give guest lectures on Spanish cartography, exploration, and culture. Her Majesty was shown a short film during the event that shows some of the resources that the Queen Sofia Spanish Institute provides NYC. A part of this film highlighted the work that Dr. Domenech and her team have done here at APRCHS. Queen Mother Sofía was also present at the event to award the Queen Sofia Award of Excellence to world famous opera star Plácido Domingo and Dr. Barraquer for their contribution to humanitarian causes. 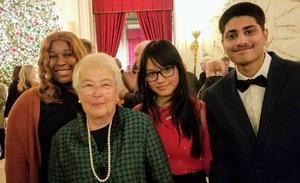 The students also had the opportunity to meet former NYC School’s Chancellor Carmen Farina who was present at the event. Special thanks to Ms. Patrice Degnan, Dr. Mildred Van Zwaren and Dr. Cristina Domenech for making this AMAZING opportunity possible for our students.